I am eyebrow obsessed. I noticed that my face looks different over the years because I wear my eyebrows differently. No one actually taught me how to groom them. I remember having my first eyebrow grooming for a fashion show when I was about 16 years old. My virgin brows went from thick to thin, messy to precisely groomed in a matter of minutes. Since then, I’ve trusted different make up artists to touch my brows, style them, and define them- shave, pluck, thread and wax the hell out of them. It wasn’t until after I got married when I had a conscious decision that I want to take good care of them. That despite being lucky I have a nice pair of eyebrows, I should regularly groom them. So when Liz of Project Vanity invited me for an afternoon of eyebrow, I immediately said yes! It was so apt that the host for that afternoon was Wink Laser & Waxing studio where we had our eyebrows waxed, and where the eyebrow tutorial by Maquillage professional and eyebrow make up by the Make Up Factory were showcased. When it comes to my eyebrows, I mostly shave them. It was ages ago when I had it plucked, waxed or even threaded so I was pretty much excited to have it groomed through waxing. For those of you who are clueless as to how to groom your eyebrows, here are some things you need to know to get you started. Different faces have different eyebrows. 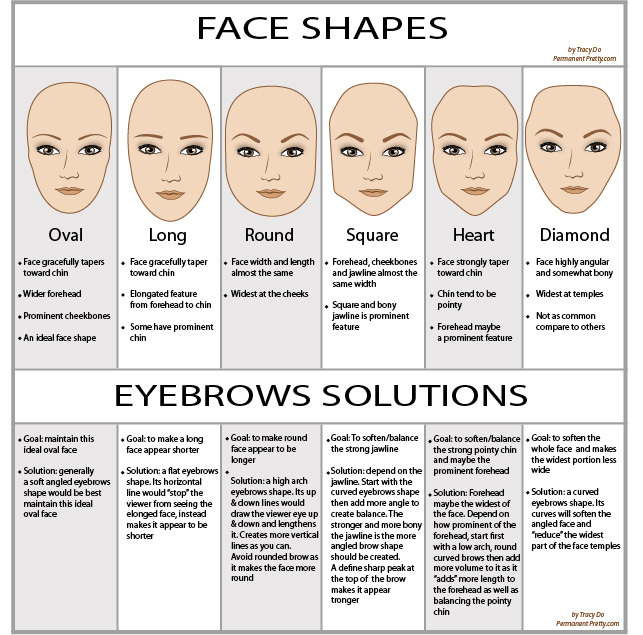 Refer to the chart below to find out what perfect shape of eyebrow fits the shape of your face. I have an oval face and a wear a soft-angled medium arched eyebrows. The start of your brow should be at the edge of your nose bridge while the arch of your brow should be at the corner of your iris (coloured part of your eye). Lastly, the end of your eyebrow should be at the corner of your eye. Use an eye pencil to measure these three major parts of your eyebrow. I’ll do a more detailed eyebrow post next time. In order for your your brow to look perfect , the top and lower parts should be groomed, removing excess and unwanted hair. You can also draw, using an eyebrow pencil, a line along the top and lower parts of your eyebrow before filling them with eyebrow make up. This will easily help you groom and shape your brows. The thickness of your eyebrow will really depend on your natural brow. But you can, of course make it thinner or thicker by grooming it the way you want to. If you’re uncertain on how to do so, it’s best to go to a waxing salon such as Wink, show to the technician a peg of the eyebrow shape you want so they can groom it according to your liking. Here I am after my eyebrow waxing session at Wink. My brows have no eyebrow make up in the photo. Notice how there are gaps in between that would look better if filled? I posted a review about how I do my brows but I have an updated version so I’ll do a separate post on that. I love that the Wink technicians are so knowledgable and would first and foremost ask you about your preferred eyebrow shape and show to you the areas that need waxing. It was virtually pain free with just one pull per area. I love! Meet Holly Chang, the woman behind Wink Laser & Wax Studio. She shared with us that she started Wink because she wants every Filipina and Filipino too, to experience having a lovely wax or laser session at a reasonable price. Eyebrow tutorial time and the model was Mommy Fleur! Fleur’s eyebrows are thin and need filling. Notice the difference? The left eyebrow is filled making it thicker and more defined. Here’s Fluer after her makeover. She’s not used to wearing thicker eyebrows kaya this is something new to her. 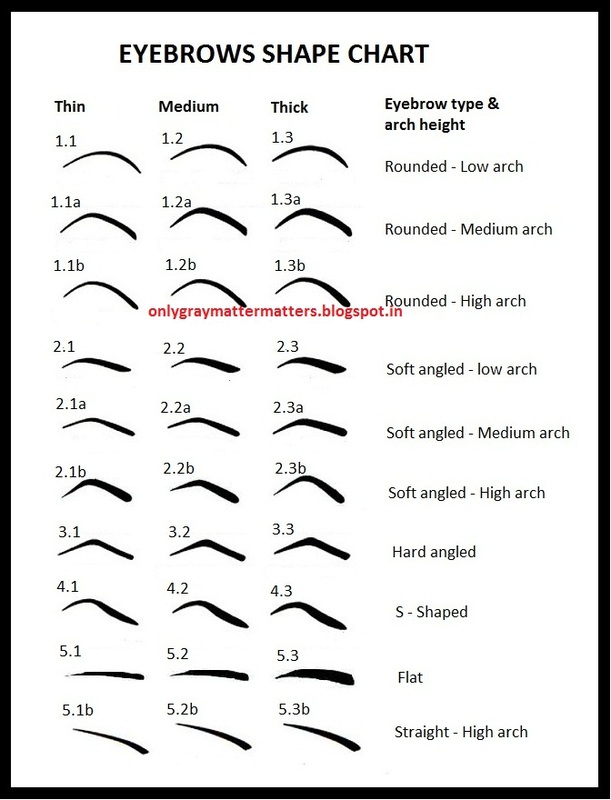 Which eyebrow do you have? Arched, flat or round? Tested Make Up Factory liquid eyebrow pencil. Here’s a swatch of their brown shade. Remember, the thicker your eyebrows the younger looking you’ll be. Thank you again Wink for the lovely afternoon! I’ll post my DIY eyebrows soon! Like Wink on Facebook and follow them on Instagram and Twitter. very nice talaga eyebrows mo Ms. Jackie. Ako I have a thick eyebrow. I kind of like it but I guess yung contour hindi ko ma kuha2x..True? if you have a well-define brow, it makes a big difference talaga.